At moments, the 2018 launch seemed like a lengthy advertisement for the ambitions of Elon Musk, SpaceX’s founder and chief executive. It carried a spacesuit-wearing mannequin, nicknamed Starman, seated in the driver’s seat of a red Roadster built by Mr. Musk’s other company, Tesla. The sports car and its driver streamed video back to Earth of their journey out into the solar system. 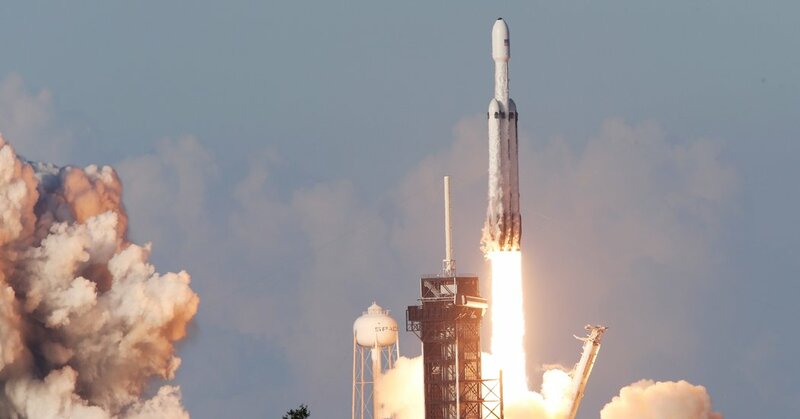 This time, the Falcon Heavy’s cargo was more mundane, but also more useful: Arabsat-6A, a Saudi Arabian communications satellite which will relay television, internet and mobile phone signals to the Middle East, Africa and Europe. Shortly after the launch, the rocket’s three boosters returned to Earth. Two touched down seconds apart at landing pads at Cape Canaveral, not far from the launchpad. The center booster, which went higher and farther, set down on a floating platform in the Atlantic Ocean. Sticking that third landing was an advancement for SpaceX, after a similar maneuver failed in 2018 on the first try. The booster then missed the platform, hitting the water at more than 300 miles per hour. For this one, the side boosters had never before been used. They were the latest version of the rocket, called “Block Five.” (“Block” is what rocket companies call a major upgrade.) That boosts the thrust and how much the Falcon Heavy can carry. Why did the second Falcon Heavy flight take so long? The Falcon Heavy is now needed for only the largest satellites like the 13,000-pound Arabsat-6A satellite, which is headed to geosynchronous orbit more than 22,000 miles above Earth. The satellite could have been launched on a Falcon 9, but with the added thrust of a Heavy, the satellite could use less of its own fuel to reach its final orbit, extending its lifetime. How climate change is sinking an Indian island.